The Darjeeling Himalayan Railway has replaced the opaque walls at the rear and front ends of two first class coaches with glasses so that travellers can see the more than century-old steam engine pull the train. Narendra Mohan, the area officer of DHR, said the refit compartments were being used for toy trains running between Darjeeling and Ghoom since May. He said two more coaches were also being given glasses at either ends and they would be put to use in two weeks. "Tourists around the world come to Darjeeling to take a ride on the Unesco World Heritage railway. 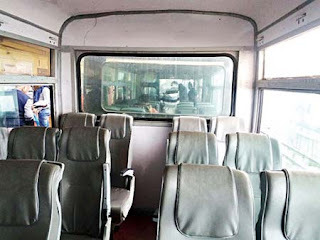 In order to make their ride more enjoyable and fulfilling, we have renovated two first class coaches and added glass windows at the rear and front ends. Prior to this, the coaches had opaque walls and the passengers in each of them could not see what was happening in the other coaches. But now they can easily do so," said Mohan. The new feature has been introduced mainly to enable travellers to see how the steam engine functions. "They will now be able to see the driver operating the engine and the fireman feeding coal into the furnace," said Mohan. "Earlier passengers could see these sights only when the train negotiated a bend. But now, they can see it anytime without having to leave their seats and rush to the windows. These coaches will be exclusively used in steam-driven joy rides between Darjeeling and Ghoom. Apart from the view in front, the tourists will also get to see the scenery behind through the glass," he added. The coaches were renovated at Tindharia workshop - the locomotive and carriage workshop of the toy train - and the Siliguri loco shed. While two of the coaches have already been put into use since the beginning of May, the remaining two will be in service within next fortnight.